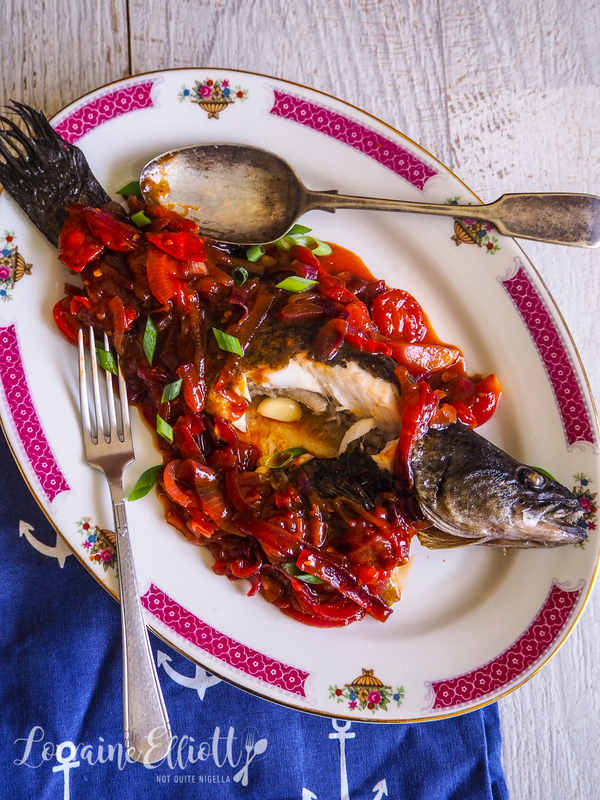 Get Schooled On Whole Baked Sweet And Sour Murray Cod! Do you find the idea of cooking a whole fish a bit intimidating? This is superbly easy recipe that gives Murray Cod some wonderful Chinese sweet and sour flavours. The whole thing is done in less than 30 minutes too. Serve this for Chinese New Year (on the 5th of February) where a whole fish is considered good luck for the year ahead! Murray Cod is a native Australian freshwater fish that you tend to see a lot on high end restaurant menus. You may have caught it in the news recently as millions of cod and bony bream were killed by a toxic blue-green algae outbreak at the Darling River. Some cod were as old as 50 years and up to 40kgs. Commercially, Murray Cod is only available through aquaculture farming in land-based ponds in Australia. The broodstock for farming is produced in hatcheries so farming operations are not dependent on juveniles caught in the wild and wild population numbers are not affected. Also hatcheries which produce Murray Cod for aquaculture often provide juvenile fish for restocking programs in rivers. Murray Cod farm Aquna in the NSW Riverina will release more than 200,000 fingerlings into the Murray-Darling Basin this month. Although it can be expensive when you order it at a restaurant, when you buy it from a fish market it isn't as the fish itself can be quite small (this was just over $10 for a 500g fish) and is a perfect size for 2 people with a side salad. It is also a really hard fish to screw up because the meat is so luscious and it's great for dinner parties because of this. I also like Murray Cod because it has a clean taste with no muddiness at all and it has large, moist flakes and the main bone is easy to remove and most of the bones tend to be quite large so they're easy to see and remove which makes it less of a choking hazard. I think it's one of the best fish to eat whole because of these reasons. But feel free to use any other fish that you like eg. snapper or barramundi or any white fleshed fish. Murray Cod is usually best steamed but because I needed to get a steamer out from the depths of my cupboards which was just way too much effort (just the thought of getting in the back of my cupboard filled me with cold, hard dread) I baked it instead. I also figured not everyone may have a big fish steamer. The sauce although Chinese in origin came from an idea at Greek restaurant Hellenika in Brisbane. There they served a whole Murray cod with caramelised onions and tomato (for $100 no less). 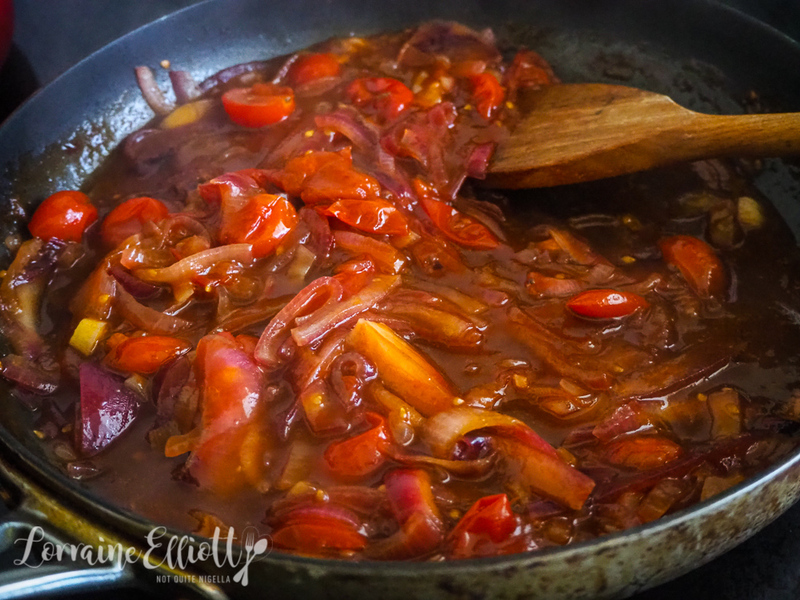 I kept the caramelised onions and tomato but decided to give it a Chinese sweet and sour flavour because the Greek sauce has a sweetness to it that I really liked. 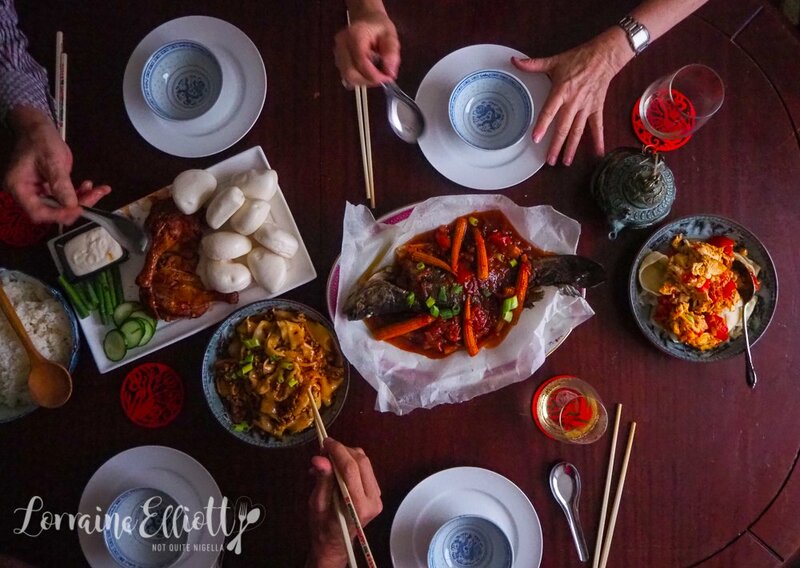 I served this Murray Cod along with some biang biang noodles and duck baos at a Chinese New Year dinner party I had with Queen Viv and Miss America. I always love having them over for dinner because dinner conversations are always so interesting. Even though I've known them for over 20 years I always find out something new about them. Unfortunately I've been sworn to secrecy for most of the juicy things but we did get onto the topic of being naughty. I think the reason why Queen Viv sometimes gets mistaken for my mother is that we are quite similar-probably more similar than me and my actual mother. And Queen Viv said that she has always loved being naughty. She used to do things to incite reactions in her parents and would routinely misbehave. "Sounds like someone I know..." said Mr NQN rolling his eyes. But I doth protest. I don't like being naughty to incite reactions or provoke people. But if I want something and a someone or something gets in my way then I may just have to break the rules. I often joke that on my tombstone there will be etched the saying, "Lived by the adage it's better to ask forgiveness than permission". Miss America on the other hand said that he was rarely naughty as a child and was too scared of upsetting people to misbehave. He did try being naughty once. He was at home alone and decided that he wanted to break a glass just to see what would happen. He picked up a glass and threw it across the room with all of his might. "It felt good but then afterwards, I had to pick up all of the pieces and that was not much fun at all," he said. So his career being naughty started and stopped fairly quickly! 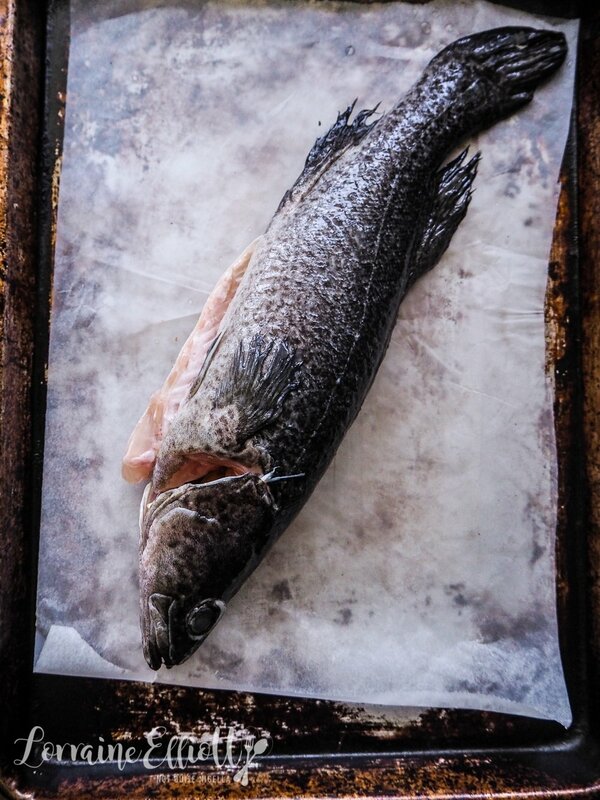 So tell me Dear Reader, have you ever tried Murray cod? How often do you eat fish? And do you ask for permission or forgiveness? Would you consider yourself naughty? Step 1 - Preheat oven to 200C/400F and line a baking tray with parchment. Brush the fish with 2 tablespoons of oil and stuff with the garlic cloves and bake for 20 minutes. Step 2 - While it is baking, make the sauce. Heat 2 tablespoons oil in a frying pan on medium heat and then add the onions. Saute for 5 minutes or so until starting to become soft. Add the tomatoes and saute for 5 minutes. Step 3 - While it is cooking, mix the water, sugar, tomato sauce, Worcestershire sauce, vinegar, chilli sauce and salt in a jug. Once the tomatoes have softened and broken down add the sauce ingredients and simmer on a medium high heat, reducing it until it is a thick, spoonable sauce (around 10 minutes). Step 4 - Place the fish on a serving platter and spoon the sauce over it. Sprinkle with green onions and serve. recipeFishing For Compliments: Tom Yum Baked Rainbow Trout! recipeWaste Not: Salmon Belly Wholegrain Rice Pot That Is Also Good For You! recipeShell Shocked: 10 Minute Garlic Parmesan Cream Scallops! 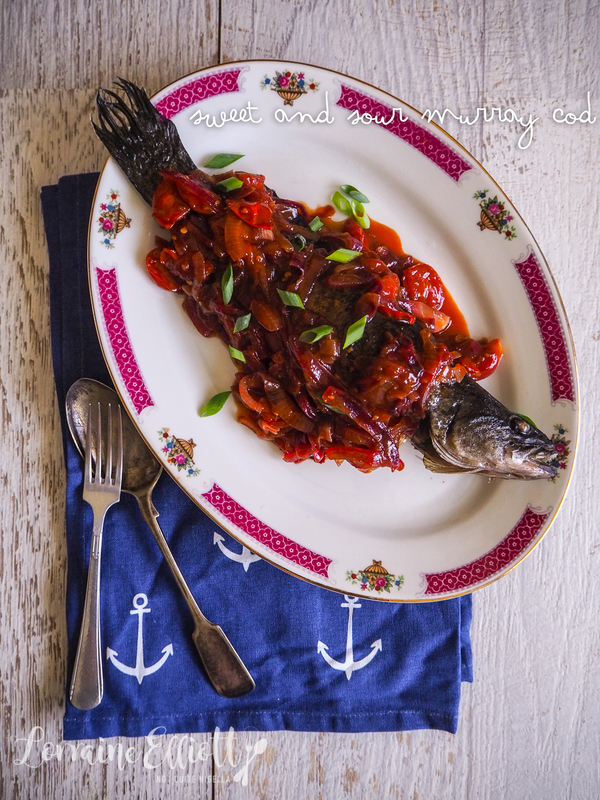 recipe Fishing For Compliments: Tom Yum Baked Rainbow Trout! recipe Waste Not: Salmon Belly Wholegrain Rice Pot That Is Also Good For You! recipe Shell Shocked: 10 Minute Garlic Parmesan Cream Scallops!